When I first started to crochet I loved learning how to crochet a flower! It was quick and simple and I had this beautiful finished project in no time. There is so much you can do with them either on their own or as accents to other pieces. You'll find yourself wanting to make more and more of these little gems. I'm sure of it. Here’s a walk through on a few of my favorites. These flowers I just call my Littles, mainly because they’re little . . . but also because they take just a little yarn and a little effort. They’re just so simple to make. There's nothing to them. They make great accents. I love to add them to just about everything. How to Crochet a Flower Tip . 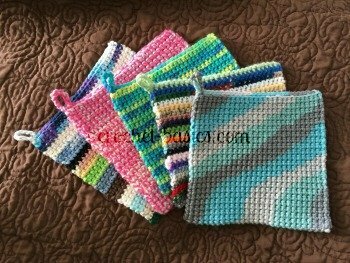 . .
You can change the size of these “Littles” by adjusting the size of your crochet hook, or the weight of your yarn. Bulky yarn makes great Littles! Repeat around - end in the joining stitch. That’s it . . .a cute, quick, little flower, just like that. This is another small, easy flower to create. It has 5 distinct petals, but isn't any harder to make. 5 sc in second chain from the hook. I use a stitch marker at the beginning of my rounds. Even though, these aren't continuous rounds, the marker makes it a bit easier. These last two flowers were simple and quick. Now let's step it up just a notch. 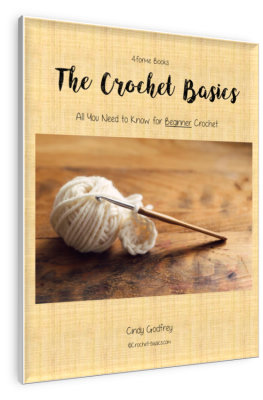 Let's walk through how to crochet a flower that's a little more intricate. . . at least it looks that way. Really, it's just as simple as the first two. The pink flower was crocheted with 3 different colors. The gray-blue flower was crocheted with 2 colors and then a dark blue accent in the middle was added; while the variegated blue was all the same color of yarn through the flower with yellow accents and a bead in the middle. I love this pattern because there are so many variations that you can do with it. Learning to crochet a flower was never more fun! The possibilities are endless, really. You only need your yarn and a little creativity. I changed yarn colors here. My flower will have 3 colors in it. Change colors here if you’re making a flower with 2 (or 3) colors. Use a contrasting piece of yarn about 3 feet long. Using a yarn needle, sew detailing in center of flower. Bring yarn up through center and back down through a place on the first petal. Bring yarn back up through the middle and back down through another place on the petal. Do this 3 times for each petal. You can also add a button or bead to the center for embellishment. You can find this great pattern and more at LittleMonkeysCrochet.com Just click on the flower to the left. These roses look so wonderful and complex, but really they are super easy! There are lots of patterns out there for roses similar to the one we're going to make and they're all great! You can find the pattern that I chose to refer to in this walk through here at Skip to my Lou. Here's how to crochet a flower rose. Skip next chain, sc in next chain. I found it helpful to place a stitch marker on the 4 hdc cluster. I kept moving it down to each new 4 hdc cluster. It helped me keep track of which cluster I was working on. To form the rose, start with the 3 hdc end and roll up into the flower shape. You can roll this as tight or loose as you’d like however you want your rose to look. Use a yarn needle to stitch the flower together on the back side and keep the rose in place. "It is simple to make different sized layered rose flowers by adjusting the beginning chain, just keep it an odd number. 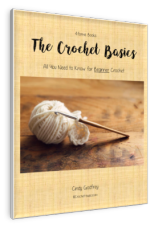 You can also change the size of your crochet hook for a smaller flower." She used 21 chains and a size H crochet hook for a small flower. In her example she also made one with 41 chains and one with 31 chains. You have learned how to crochet a flower! It's simple, right. Now you just need some crochet leaves to go along with them! Keep practicing. You'll be an expert in no time.